The CCRI Foundation honors champions of business, education and community during a ceremony at Rhodes on the Pawtuxet in Cranston on Dec. 1. More than 180 people attended “A Cool Winter’s Evening” at Rhodes on the Pawtuxet to honor Year Up Providence as a Community Champion; Independent Insurance Agents of Rhode Island in Warwick as Business Champion; and Walter ’98 and Eileen Jeanes Jachna of Newport as Education Champions. In addition to the awards ceremony, silent and live auctions raised funds for student scholarships. Lifespan, Amica and The Washington Trust Company also provided key contributions through sponsorships. CCRI President Ray Di Pasquale introduced the champions and thanked them for their contributions to the college and the community. 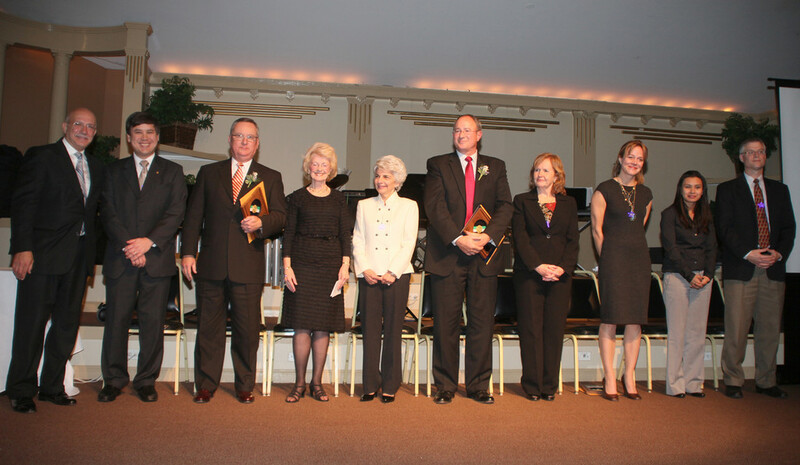 The award ceremony included a video presentation featuring the honorees and their achievements. Mark Male, executive vice president of Independent Insurance Agents of Rhode Island, accepted the Business Champion award and said the organization sees donating to CCRI as an effective way to give back to the state as a whole. After receiving the Education Champion Award, Walter Jachna said that CCRI’s mission to educate Rhode Islanders has become even more important given today’s poor economic conditions. “[CCRI] provides our citizens with an affordable opportunity to get an excellent education,” he said, adding that he hopes state support for the institution will be expanded.